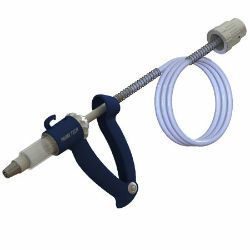 This injector was specifically designed with injectable dewormer in mind. Two types of barrel materials are offered, polypropylene and polycarbonate, to meet every producer’s needs. Packed with soft medical grade tubing, hose armor springs, metal luer lock needle nut, and new Uni-Lock Draw-Off.